This week on WWE Friday Night SmackDown, Seth Rollins faces Kane, Roman Reigns takes on Daniel Bryan, and Dean Ambrose faces Randy Orton. Sounds like a good night to me. BTW, I apologize for the lateness, but I’ve been at Comic-Con all weekend. Sorry, but meeting nerd icons and buying nerd merchandise takes precedence over wrestling. We’re starting the show off with one of the featured matches, and that’s okay in my book. Rollins fires off some rights and locks in a side headlock. Kane counters, Rollins ducks a clothesline and runs into a shoulderblock. Rollins avoids a corner whip before running into a big boot for 1. Kane hits a delayed vertical suplex for 2. A rear chinlock is applied now, and Rollins fights out before getting hit with a back body drop for 1. Snapmare by Kane, but Rollins avoids the dropkick by hitting a high knee. Rollins stomps Kane, then tries to work over Kane’s left leg. He hits a rolling leg snap before kicking the back of the knee. Kane comes back with rights, but Rollins drops him by booting him in the knee. He attacks the knee in the ropes, then goes for a stretch muffler. Kane boots Rollins away. Rollins mounts the middle buckle, but Kane uppercuts him, then goes for a goozle. Rollins breaks free and hits a leaping tornado DDT for 2. Commercials. Back from the break, Rollins has Kane locked in a half-Boston crab. Kane kicks free and hits Rollins with a tilt-a-whirl powerslam. Kane nails a couple rights and a corner clothesline. Rollins blocks a second, but runs right into a sidewalk slam for 2. Kane goes up top for a flying clothesline, but he’s having trouble. Rollins cuts him off and goes for a superplex, but Kane headbutts him down. Kane connects with the clothesline, then calls for the chokeslam. Reigns jumps on the apron, and Kane chokes him. Rollins uses the distraction to nail Kane with a Ghetto Blaster. He goes up top, but Bryan shoves Rollins down as the ref is arguing with Rollins. Kane hits a chokeslam and gets the 3. WINNER: Kane. The two teams argue after the match, and it looks like we’re going right into the next one. Rollins immediately attacks Bryan with kicks to the head. He stomps Bryan down in the corner before Bryan trips him into the middle buckle. Bryan fires off some kicks, then drags Reigns to the middle of the ring for a spinning toe hold that he turns into a deathlock. Bryan lays in some forearms while in this position, then gets a 1-count. Bryan hits some more kicks, then lands a dragon-screw. Bryan hits a series of kicks and elbows before Reigns hits a back elbow and knocks Bryan down with a clothesline for 2. Commercials. Back from the break, Bryan is hitting kicks and punches before Reigns drops him with a jumping clothesline for 2. Reigns sends Bryan into the mat, then runs through him with a shoulderblock for 2. Bryan gets sent into the corner, but Reigns misses a splash. Bryan gets back up and hits a running corner dropkick. He fires off a bunch of kicks to the chest, then hits a low running dropkick in the corner for 2. Bryan loads up the No! Kicks, but Reigns ducks the Buzzsaw, headbutting Bryan in the process. Bryan backflips off a corner whip, ducks a clothesline and goes into a crucifix that he turns into the No! Lock. Reigns begins crawling towards the bottom rope, and Rollins pushes the rope in to make it easier to reach. Kane nails Rollins on the outside, so Reigns nails Kane. Kane retaliates, and the referee sees it. WINNER VIA DISQUALIFICATION: Roman Reigns. The members of Team Hell No! argue after the match, with Bryan poking Kane in the chest and screaming in his face. Kane gets tired of Bryan screaming and walks away. Bryan follows, berating Kane the entire time. Sheamus comes out and says Sandow couldn’t leave well enough alone. He tricked Sheamus last week, and should have just walked away. But now, Sandow is out here playing with his cups. Honestly, Sandow is just annoying everyone here, including Sheamus, so he’s here to end this once and for all and beat Sandow at his own game. Sandow goes through the game, mocking Sheamus the entire time. It’s time for Sheamus to choose, and he only gets one choice. Sheamus is trying to pick, and Sandow is egging him on. Sheamus chooses, and it’s the wrong cup. Sandow tells Sheamus his idiot license is good for another year. But, now, because he likes Sheamus, he’s going make the game simpler by removing a cup, so we’re now down to two. Sheamus once again chooses incorrectly, and Sandow calls him incompetent. Sheamus cuts him off and says Sandow has beaten him, but he won’t be happy until he sees the red ball under the remaining cup. Sandow tries to change the subject, and Sheamus says he won’t be satisfied until he sees the ball. Now lift your hand off the cup. Sheamus grabs the cup away from him without lifting as the crowd is chanting “Show your ball!” Sheamus lifts the cup, and the ball is gone. Sandow says he’s also a magician, and there is no end to his talent. Sheamus says if Sandow is truly the intellectual savior to the unwashed masses, how did he get caught cheating? Sheamus does a rhyme that ends in “Brogue Kick”, then levels Sandow with it after throwing the cup at his head. You’re welcome. Before the next match, Paul Heyman introduces himself and says that people say you can tell Heyman is lying when is lips are moving. The fact is, when he speaks, he always tells the truth. For example, the fact that Curtis Axel has made unprecedented accomplishments during his first week in WWE. He will now allow Axel to discuss his accomplishments himself. Axel says Triple H and John Cena have a combined 26 WWE or World Championships. But against Curtis Axel, they’re 0-2. He beat Triple H up so bad he refused to continue, which is tantamount to a submission. Last Monday, John Cena was so afraid to fight Axel, he ran out of the ring, intentionally getting himself counted out. No one in WWE history has made the initial impact Axel has, but when you’re a Paul Heyman guy, life is perfect. Axel starts with a boot and some punches. Backbreaker connects, as does a dropkick off the ropes. Axel applies a neck vice, then knees Cara in the back before going for a rear chinlock. I have noticed Cara’s stupid lights are no longer on during his matches. Anyway, Axel goes for a powerbomb, but Cara counters into an armdrag, hits some kicks and a hurricanrana. Cara hits the twisting springboard armdrag, sending Axel to the corner. Axel backdrops Cara, but Cara lands on the apron and hits a kick, following up with a springboard cross-body. Axel counters the handspring back elbow with a forearm to the back of the neck. Axel then hits the Perfect-Plex for 3. Langston rams ADR into the corner, but ADR blocks a charge, then hits a step-up kick to the gut, followed by a kick to the side of the head. Langston comes back with a gut shot before hotshotting ADR across the top rope for 2. Langston applies a waistlock, but ADR fights out. Langston cuts him off with a kneelift and follows up with a ribbreaker for 2. ADR gets propped onto the top rope, but kicks Langston away before hitting a seated dropkick. He hits a trio of clotheslines, ducks one and goes for the Backstabber, but Langston counters into a belly-to-belly suplex for 2. Langston goes for the Big Ending, but ADR escapes and hits the Backstabber. Langston crawls to the corner, where ADR misses the step-up enziguri. Langston goes back to the waistlock, and ADR counters into a German suplex. ADR hits a thrust kick to the face for 2. ADR calls for the rolling jujigatame and locks it in. Langston powers out, hits a gut shot and a running clothesline for 2. ADR rolls to the apron, and as Langston comes after him, he applies the armbreaker over the top rope. After the ref breaks the hold, ADR falls to the floor, where AJ rakes his eyes. Langston rams him into the post, throws him back in the ring and hits the Big Ending for 3. We see an ambulance pull into the arena, and Ryback exits out the back. Looks like he’s got a match. Before Kofi makes his entrance, Ryback checks under the ring for something before getting in the ring. Kofi immediately nails a dropkick and some rights. He mounts Ryback in the corner for punches, flips off and hits a European uppercut. He follows up with some kicks until Ryback blocks him and shoves him to the mat. Kofi comes back with a quick kick to the head before getting backdropped to the apron. Kofi hits a springboard seated missile dropkick for 2 before hitting the Boom Drop. He signals for TIP, but Ryback catches him and goes for a powerslam. Kofi escapes and hits a springboard cross-body for 2. Ryback charges into the corner, where Kofi moves and goes for the Pendulum. Ryback blocks it and stomps Kofi’s face into the mat. 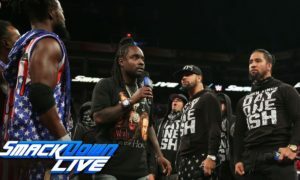 The Meat Hook connects, and Kofi gets laid out with Shell Shocked for 3. WINNER: Ryback. Ryback heads outside and pulls out a table, which I guess is what he was looking for before. He sets it up in the ring near the corner, and puts Kofi through it, courtesy of a powerbomb. Ryback then pulls another table out and puts it in the ring. He sets it up, and Kofi once again gets powerbombed through it. Once more, Ryback goes for a table, sets it up and powerbombs Kofi through it. Looks like Kofi will be leaving TV for a while. We see a video for CM Punk. Renee Young is standing by with Chris Jericho. She asks his thoughts on facing CM Punk at Payback. He says when Punk associates with dogs like Heyman, you get every disease a dog could ever have. To paraphrase his nemesis Bob Barker, at Payback, he’s going to make sure CM Punk gets spayed and neutered. Lock-up to start, with Jericho going into a headlock. Rhodes breaks it and trips Jericho, goes into a crisscross, and ends up getting a dropkick by Jericho. Jericho clotheslines him to the floor, then follows up with a baseball slide. Outsdie the ring, Jericho slams Rhodes into the barricade and rolls him back in the ring. Rhodes comes back with a kick and a hotshot for 2. Rhodes stomps Jericho down, then assaults him with rights and knees. Jericho comes back with chops to the chest before sending Rhodes to the corner. Rhodes avoids the charge, suspends Jericho across the top rope and kicks him in the midsection for 2 (think Bob Holly’s old move). Rhodes applies a modified hammerlock that he turns into a rear chinlock. Jericho fights out and shoulders Rhodes off the ropes twice before Rhodes sends him outside. Jericho lands on the apron, goes up top and hits a double axe handle before hitting a running facebuster. Jericho goes for the Walls, but Rhodes spins out of it. Jericho gets back up and hits some chops to the chest. Rhodes counters a corner whip, catches Jericho in the corner and hits an Alabama Slam for 2. Rhodes mounts the top rope, but gets nailed in the gut on the way down. Jericho forearms him in the back, hits a bodyslam, but gets the Lionsault blocked. Rhodes goes for Cross Rhodes, but Jericho breaks free, only to get rolled up into a small package for 2. Jericho blocks the Disaster Kick and turns it right into the Walls of Jericho. Rhodes taps. We get a vignette for the Wyatt Family. Mark my words, this gimmick is money, especially with Bray Wyatt as the leader. Lock-up to start, with Orton turning it into a side headlock. Ambrose backs Orton into a corner, then punches him down. Orton comes back with some kicks, but Ambrose stops him with a headbutt before stepping on his face. Orton gets his face raked across the top rope before coming back with a kick. Ambrose reverses a corner whip and Orton comes back with a clothesline, followed by a suplex. Mounted corner punches by Orton, and a European uppercut gets 2. Ambrose rams Orton into the corner, then follows up with a kneelift to the face and some rights. Ambrose ducks a clothesline, but gets hit with a Thes Press. Ambrose rolls outside, and Orton meets him with a clothesline. Orton back suplexes Ambrose across the barricade before slamming him into the apron and rolling him back inside. Ambrose hits a back elbow through the ropes and suckers Orton outside, where he throws Orton shoulder-first into the steps. Short-arm clothesline connects as we go to commercials. Back from the break, Ambrose has Orton in a sleeper. Orton fights out, but gets caught with a kitchen sink for 2. Ambrose stomps Orton’s left hand, then stomps Orton in the corner. Orton fights back with punches and a European uppercut before getting locked in another sleeper. Orton fights out, gets caught in another sleeper, and counters it into a back suplex. They trade headbutts and punches until Orton dominates, which leads into the Four Moves of Boredom. However, Ambrose counters the DDT with a hotshot, then goes up top. Orton cuts him off with punches and goes for the Ace Superplex. Ambrose headbutts him down and goes for a dive, but gets caught with a dropkick for 2. Ambrose gets sent to the corner, where he blocks a charge. Off the ropes, Orton side-steps him, throws him through the ropes and hits the suspended DDT from the apron. Orton coils up for the RKO, but Ambrose sees it coming and rolls to the floor. Seth Rollins and Roman Reigns hit the ring, leading to the DQ. WINNER VIA DISQUALIFICATION: Randy Orton. Orton fights them off until the numbers are too much. Team Hell No! eventually run down and even the sides. Daniel Bryan completely dominates The Shield the by himself. Eventually, The Shield bail, and Bryan is standing tall as Orton and Kane look on in amazement. I love The Shield, but I also absolutely love how Daniel Bryan is being booked lately. I think WWE is really starting to see something in him again. While booking Bryan as a legitimate threat while simultaneously still booking The Shield as the most dominant force in WWE, this can’t be anything but good for everyone involved.